It is so nice to go away for a time isn't it? We relax, we rest, we tour places and sights we haven't seen before, we take the time to talk, dine, shop, and just rock on the porch if we want to. I can only think there is one thing better and that is ... coming back home. Let's start with the veggie garden today. A big, hardy shout-out to my loyal (and kind) widowed neighbor who painstakingly listened to all my droning detailed instructions requests for watering the veggie garden and all my container pots while hubby and I were away. Truthfully, the garden is my biggest concern when taking vacation time. It used to be the kids but these days they are all planning their own get-a-ways and enlisting ME to watch their kids when they go. To that I say ... yay! Anyway, I came home to the newly planted garden well taken care of and pole beans already climbing their way up the poles. I've been busily gardening everyday since we got home. So much to trim, prune, plant, dig and generally clean up. One thing I notice every time I take a break from the garden. When I come back to it with fresh eyes, I see it differently than when I left it. Upon my return, I was pleased about some things and .... well, not so pleased about some things. It seems so all-of-a-sudden the caladiums are rapidly wilting. What's left in the bed (above photo) won't last too much longer. I'm determined to leave them until they bow their big-hearted heads in an attempt to stretch their use as long as possible. 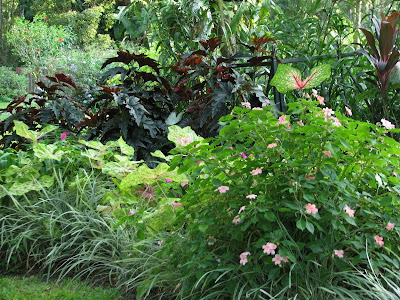 Not so fortunate were several other beds where I snipped and snipped away to remove wilted caladiums and impatiens too. The impatiens will bud and bloom right back but the caldiums are gone until next spring. My clean up project started right here on the back porch trimming away at the container plants that were spilling over onto the ground. I know I've shown you this mona lavender recently but it continues to awe me how this originally 6" pot turned into the profusely blooming, falling over the pot plant you see in the foreground. Every time I think I'm ready to yank it out, I have to stop myself and remember to let it stay until this flush of blooms drops off. It may be too late to plant something else in its place by then but I'll not worry about that now. Did you notice the angel-wing begonia in the corner? I thought to actually measure it today. The tallest stalks are 6.5 feet tall and the width of the planting is over 4 feet. I can boast about its beauty because honestly, once I planted the stalks, all I ever have done is water it. So by its own inherent power it has become what it has become over these summer months. AND it just keeps right on blooming its blush pink drippy flowers. Speaking of huge. The deep orange lantana residing in the SE corner of the property is all of 4' tall and what is visible in the above photo doubles in size as it wraps around the corner and behind here. I hand pruned some of the heavier, woodier branches just to keep them from entangling around one another. It's also a good idea to pick up the branches from underneath and trim off whatever is touching the ground and some of the weightier bottom branches. Once I did all of this the unburdened plant perked up even taller and it will be ready now to keep on producing right through the autumn season. The sulphurs flit about so quickly it is not usually possible to capture a photo of them. This one landed on the Raphis Palm and sat there just long enough for a snap in its momentary resting position. My fresh eyes are still very pleased with the deeply green topside and magenta-ish underside hues of dragon wing begonias. They are happily standing tall above the fading caladiums and in between lily of the nile and mexican petunia towering in the background. 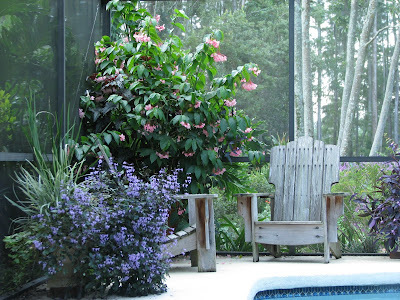 The huge impatien in a container pot in the foreground was dotted with caladiums that I pruned out. It really should be cut back as well... maybe next week. This view reveals the back side (if there is one) of the same planting bed. One does have to walk around the bed to see this view of two beds melded together and only divided by a small arbored pathway. Tall and still blooming are the pink pentas posing in the foreground. 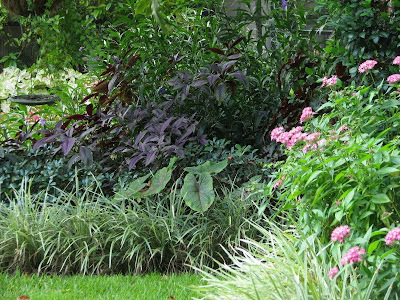 Across the swath of grass there's the contrasting purple of persian shield layered in front of the still taller mexican petunia and behind a layer of indian hawthorne and variegated liriope serving as the continuous border around both planting beds. Above you can see still another side of the same planting bed. 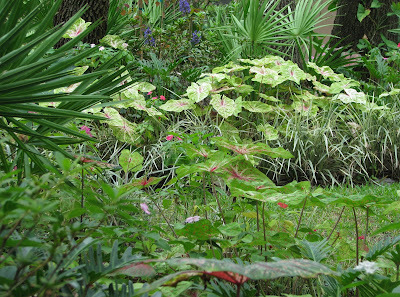 This corner home to carolyn wharton caladiums blending in with the colorful brazilian red hots. Happy gardening all. Enjoy your days of October while they last. What a lovely garden you have! I, too, have just planted my veggies in the garden. I just love our Fl. fall/ winter season. Yes, I love that fresh eyed look at the garden too. Did Inotice that begonia. You bet. I just love those begonias. I have one that is tiny compared but I am going to bring it inside this fall. I should say soon because the weather people say that we have one week before a good chance for frost. Then I won't have any true challenges in the garden other than trying to be patient awaiting spring. Good to see that your garden survived and thrived with you being gone. Your gardens remind me of a lush tropical paradise. I'm sure you didn't see anything any more lovely while on vacation than your very own beautiful haven. I'm sure it was nice to get away to rest and be pampered! Your caladiums are beautifully large. 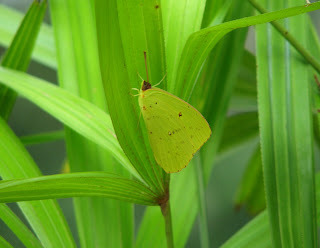 In one of your photos, a leaf flutters like a butterfly above the other plants! Your begonia has assumed gigantic proportions. I have a small begonia that was purchased this Spring. I'm hoping it does well for me indoors this Winter. It will come back outdoors in the Spring. I can't imagine it ever getting as large as yours!! (I'd have to use a truck to take it in and out!) ha. Lovely, as usual, Meems. Between the drought earlier this year and unusually frequent trips this summer, our gardening truly suffered this year. You are fortunate to have a kind neighbor to tend to your plants while you are away. my mother's garden: Our Florida winter is definitely paradise. Autumn is almost as good and our spring has to be the best of all. Hope all goes well with your veggie garden. lisa: You have some lovely begonias too. Some varied and unusual types that are kind of finicky down here. Wow... you are already thinking about a frost. We are heading into the seasons where the contrast in our zones is dramatic. robin: it was nice to get away for a break... no pressures, no resposibility. Thank you for your very kind remarks. 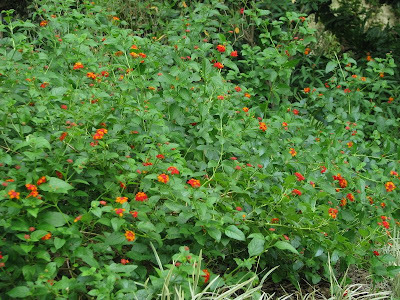 shady: lantana can actually be trimmed into a hedge down here. I don't do that because I like it left sort of trailing and natural. I've never seen berries on any of my lantana but I've been noticing it on other blogs. I think it's because down here they just keep flowering. I do hope your begonia does well indoors so in the spring you can enjoy it outdoors again. It is always a sad thing each year for me to see the caladiums go. But then again it's always exciting when they come back again in the spring. 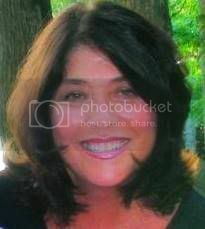 Patricia: Thank you. Going out of town is something we do frequently in the fall. The garden demands attention with this drought... my neighbor is a dear. Your garden still looks great Meems. Your veggies look like they are doing well. How long are you able to keep gardening? Raquel: Well the garden doesn't look as good as it did a month ago but I'm not complaining. To answer your question... if you mean regular gardening? We pretty much garden all year long. Remember our winters are warm and mild with a very rare chance of frost/freeze. The grass gets mowed right through the winter, too, even though not as often. If you are asking about the veggies... most of what I have growing will harvest at the end of November/into December. I probably won't plant veggies again until late February. meems how great to come home especially to new veggies growing even though you weren't there. thank God for your neighbor, i think he might like some banana cake as a thank you! lol! the lantana is amazing with all the profusion of blooms. your garden is doing very well inspite of the lack of rain. we are in desperate need of rain here. i meant to tell you on the last post i love that photo of the twisted trees and it did remind me of your street too. Your garden is still quite lovely. Fresh eyes...I like that. I always seem to see what needs to be done, not what has been done. 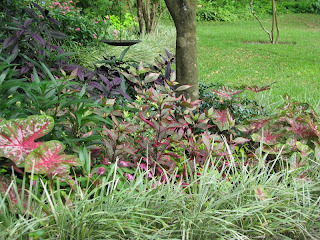 I love visiting your garden and seeing all the amazing tropicals. The lavender is awesome. I have tried some hardy lavenders without success. None of them holds a candle to yours. Lovely as always. Most of the veggies I planted didn't come up. I may try again or it may be too late. Just trying some winter veggies. marmee: How did you know he got a banana cake? I think I actually put the recipe to our infamous family cake on line here last Christmas. Nope... I just checked and it was my pumpkin bread recipe. Oh well... maybe this year. We actually got a good rain here tonight. What a relief after 2 weeks of none. I sure hope you get some soon. Marnie: did you know Mona Lavender isn't really lavender at all... well it is the color lavender but not in the lavender family of plants. Every spring I buy lavender and it does well until the rains of summer come. Next year I'm going to put it in a container pot with "sandy" soil and let it have its dry habitat... I'm hoping I can fool it into growing all summer. joey: ...and I certainly enjoy you coming around for a visit. What a kind thing to say. Hugs. Cameron: I sure hope you are relaxing and enjoying your vacation. It is a beautiful time to be at the beach. My neighbor is a perfectly kind and wonderfully helpful man. We have helped each other for many years. Lola: It's probably not too late if you bought some plants... It might be too late for seed where you are. I planted another row of green beans today. We'll see how they do. I am amazed at how large some of your plantings are--the lantana grows nicely here, but never to that size! And the angel-wing begonia is beautiful. Your garden is a treat for the eyes. Awesome to quote a younger crowd! It is quite lovely in your garden, it continues to be a source of enjoyment for me to visit and see what you have created. I love Mona Lavender, it is quite my favorite plectanthus with the velvet purple and green leaves. I can't begin to imagine what a six foot Begonia would look like in my garden...an alien amidst the asters! But it looks spectacular in yours. It's good to step away but always good t gey back home. Have a great rest of the week! opps....that is supposed to read always good to get back! I love your gardens, everything is so beautiful and healthy! Rose, Hi! Thank you for your kind observations. 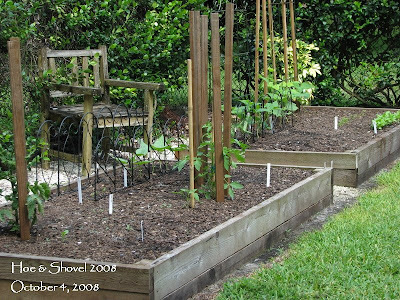 Most of what you see in Florida gardens is growing all year long. We do have a slowing down period for growth when the days are shorter. But, consider this... the soil rarely gets really cold and the sun shines almost every day of the year-- it makes for gardening all year long... big plants in the summer. I must admit I have become a huge fan of the mona lavender this year. Any plant that has beautiful foliage along with blooms and actually likes our humidity is a keeper! Dani: Thanks so much for stopping back by. From a fellow Florida gardener your nice words are extra special. I know you know what it takes to keep things going down here. Just another day in paradise, meems :-) I get garden envy just visiting your blog, not only because of the large space and beautiful garden you have but the weather which allows one to practically garden year-round. Meems, I saw that you said you tried growing lavender but it fizzles out in the heat. Do you grow French Lavender? I have better luck with it. Your pool area is screened, right? That would be a good place for it since the screen filters out a lot of the sun's rays. It's nice to be relaxing in the pool and have the breeze carry the scent of lavender scent over to you. carolyn gail: I got weather envy when watching (on TV) the Tampa Bay Rays play in Chicago the other night and everyone was wearing light weight jackets. Oh well... you are right. We couldn't garden all year if we didn't live so close to the equator. green jeans: Hi. The lavender I find locally is English Lavandula. I think my biggest problem with it is that it doesn't like my rich, humus soil. Next year I'm going to try it in a pot with sandy soil. But I will also look for the French Lavender as you say (thanks for the tip), maybe that will work better for me. Love the fragrance of even the leaves snipped off. I would walk by it and pick a piece off just to take in big whiffs of the clean scent. I just keep clicking and enjoying, Meems! Your begonia is magnificent. Mine are teeny compared to. A friend gave me a babywing cutting last spring and that's been just like your angel wing..on a smaller scale. It's been a joy all summer on the porch and is indoors now. I even used it as a centerpiece in church recently and everyone loved it. I have to cut it back because it just keeps on growing and blooming. I need to put it in a larger pot. I wonder if the mona lavender will grow here. It's gorgeous! You have a real talent for combinations..wonderful!